Remember the Rule of Thumb: When in doubt, ask. We know how important your child’s health is, and we are here to put you and your child at ease. Q: When does my child need his/her first eye exam? Answer: According to the American Optometric Association (AOA), children generally should have their first eye exam at six months of age, another exam at age three, and again at the start of school. “Risk-free” children should then continue to have their eyes examined every two years until age 18. Children who currently wear eyeglasses or contact lenses should have annual eye exams, according to the AOA. Q: Why is it required before school? Answer: Children need regular eye exams to detect vision problems that may interfere with learning. Routine eye exams are essential for children to be ready to learn in school, and experts say more than 80 percent of information children receive in classrooms is presented visually. Q: Does my child need an exam before six months of age? Q: What’s the best way to prepare my child for a visit? What should I expect? Answer: Every child and exam is different, but here are a few things we like to let our parents know in advance. Our doctors do not wear white coats at Visionary. One of the reasons we do this is to make children feel more at ease. You can tell your child that they are going to see “Michael” or “Jamie” or you can simply say, “the optometrist.” Sometimes telling a child that they are going to see the eye doctor makes them apprehensive, because they only hear the the “doctor” part, and they’re already afraid of shots and pinches. There will be a vision test with letters, but if a child is not comfortable with letters for any reason, we have charts that use numbers and some that use symbols that are readily identifiable by most children. Sometimes we will need to dilate a child’s eyes or use other drops. We tell children that by the time they count to ten slowly, the stinging will go away, and that usually helps immensely. You may want to prepare your child by putting rewetting drops in his or her eyes to practice. The drops we use only sting for a few seconds, but for a child, having their eyes held open while a stranger puts stingy drops in them is no fun. We use every method we can to make this as quick, easy, and calm as possible. Q: My child is entering kindergarten. Do I need to make an appointment for him/her? Answer: Illinois State Law requires comprehensive eye exams for children entering kindergarten or enrolling for the first time in public, private, or parochial elementary schools in Illinois. Children will be required to have the eye exam performed only by qualified eye doctors. Please arrive 15 minutes before your appointment to complete paperwork. You can also download and fill out the necessary forms in advance by going here. Q: What is the InfantSEEⓇ program? Answer: InfantSEE®, a public health program, is designed to ensure that eye and vision care becomes an integral part of infant wellness care to improve a child’s quality of life. 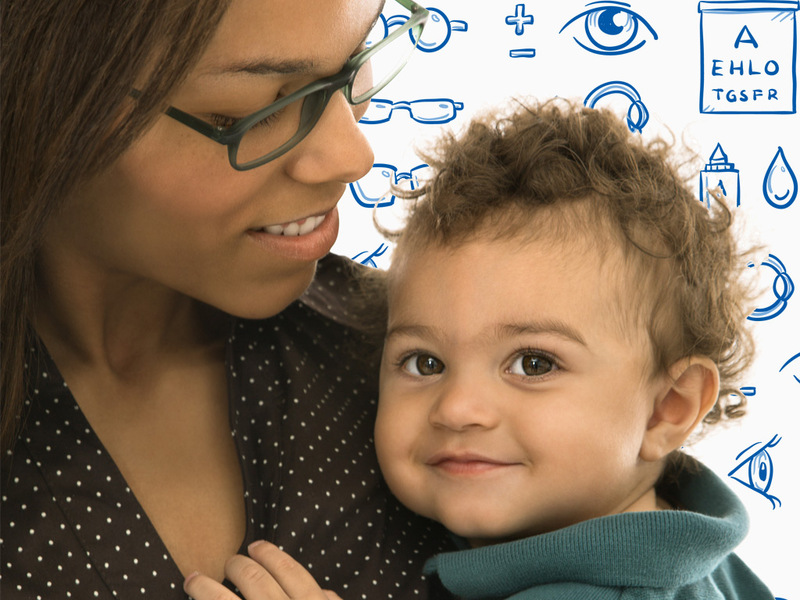 Under this program, AOA optometrists provide a comprehensive eye and vision assessments for infants within the first year of life regardless of a family’s income or access to insurance coverage. Learn more about InfantSEE®.